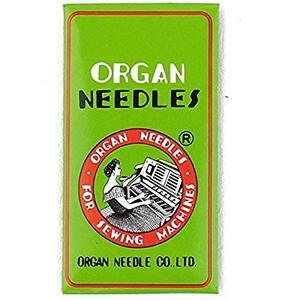 "I was very happy that I found these particular machine needles. I've been using them since they arrived in the mail several days ago and still have not broken one needle compared to the regular machine needles I had been using for several months. Some days I was going through as many as 5 needles a day, sometimes more due to breakage. I didn't even know these special needles existed until I accidentally came across them on your website, they aren't found on most other web sites that sell machine needles, including Amazon (that I know of). It was a pleasure doing business with Allbrands and I will be a repeat customer. Thank you!". Debra M.
The HLX5 Chrome and/or PD Titanium is in reality a step up from the Schmetz 130/705H-J since they are an “Industrial Needle” with a flat shank. Keep in mind that the Schmetz 130/705H-J points are medium ball point so you might want to use the HLX5 in BP in chrome & PD. The HAX130EBBR can also be used in place of the Schmetz Jeans as they too have a reinforced blade and are automatically ball point. *for Home Sewing and Quilting Machines, Choose Size 9, 10, 11, 12, 14, 16, 18. and 20 (135x5 style with Flat Shank, Same Applications as for Commercial Use 135x5 Round Shank, but this needle is Flat Shank like 15x1, HAx1 and interchangeable on portable home sewing machines. Up to Size 18 recommended for free motion quilting, especially with machines on frames going at higher speeds. Organ has finally developed a Schmetz-quality 15x1 Quilting Needle HLx5 for Juki TL98E, Brother PQ1500, Janome 1600P and all the other home sewing machines used for quilting. Schmetz has the 130/705H-Q quilting needle. Organ keeps sizes 11, 14 and 16 in stock. Specify only one of these sizes below. This HLx5 needle is made for sewing hard, thick or heavy materials. It will sew through multiple ply applications like quilting, jeans, applique or heavy embroidery. It is actually an industrial needle with a flat shank. If you are bending or breaking 15x1’s this needle could solve your problem. These hard chrome needles will outlast a standard 15x1 and the PD/titanium needles are even more wear-resistant. They are available in either sharp or ball point with a hard chrome or PD/titanium finish. This needle is made for sewing hard, thick or heavy materials. It will sew through multiple ply applications like quilting, jeans, applique or heavy embroidery. It is actually an industrial needle with a flat shank. If you are bending or breaking 15x1's this needle could solve your problem. These hard chrome needles will outlast a standard 15x1 and the PD/titanium needles are even more wear-resistant. They are available in either sharp or ball point with a hard chrome or PD/titanium finish.